Do you desire to have more faith? Scripture tells us that faith can grow and increase. Notice that today’s Scripture doesn’t say, “Faith comes by having heard the Word of God one time.” It says that faith comes by hearing — in the present tense. We have to hear the Word of God over and over again in order for it to take root in our hearts and transform our minds. Sure, God’s Word can transform us in an instant, but most of the time, our faith grows as we hear the Word of God again and again. Just as a seed needs water daily to grow, your spirit needs the Word of God daily. The more you hear God’s Word, the more you know Him. The more you know Him, the more you will be able to believe Him — and that’s what faith is! Let’s take a closer look at Faith, and Understanding how Faith works. “Now FAITH is the SUBSTANCE of things hoped for, the EVIDENCE of things not seen”. +Substance means that you have the things HOPED for CONFIRMED in GOOD FAITH (by your faith). It’s like having the TITLE DEED to a HOUSE or a CAR without seeing the actual house or car. +But you know and you are completely convinced that you have the house and the car without actually seeing them just because you have the TITLE DEED (FAITH). +This is what “Faith is the substance of things hoped for” actually means. Amen! +What is the EVIDENCE of things NOT SEEN? +EVIDENCE are PROOFS of things not seen, and the conviction of their reality. +EVIDENCE: indisputable FACTS that prove the reality of things. +Faith perceiving as real fact what is not revealed to the senses. +The Word of God is the EVIDENCE for all the promises of God. +The Word of God is also the EVIDENCE of things not Seen. +Our FAITH in the EVIDENCE (God’s Word) causes the the Promises to be materialized in our lives. Praise the Lord! +Walking In FAITH is similar to walking in the SPIRIT. +We don’t rely on our Five Physical Senses (Hearing, Seeing, Smelling, Tasting and Feeling) to navigate us. +Instead we follow the instructions of God’s Word and the leading of The Holy Spirit. +The Holy Spirit leads us from within our hearts (the spirit and soul person we are who is in our bodies). +From within our hearts the Holy Spirit gives us Promptings and Impressions. PROMPTINGS: Heart to heart, or Spirit to spirit the Holy Spirit says, or does something that gets our attention. IMPRESSIONS: spiritually sensing the inner expressions that are communicated to us by the Holy Spirit. Normally these are instructions do something or say something. +Walking by Faith in God tells God that we are still BELIEVING in Him and TRUSTING in Him. Hallelujah! The Language of FAITH and how FAITH speaks. …even God, who gives life to the dead, and CALLS THOSE THINGS WHICH ARE NOT AS THOUGH THEY WERE. +When FAITH SPEAKS it calls those which are not as though they were. +If someone is sick and confesses I’m not sick, I’m not sick, I’m not sick. +This is denial and incorrect confession, and also working the principle backwards. +To say I’m not sick is to call the things that ARE AS THOUGH THEY ARE NOT (this is denial). +The proper confession by the Law of FAITH in Christ Jesus should be I’m headed!, I’m healed!, I’m healed! +This is calling the things that are NOT (the healing in Christ Jesus) as though it were. This is also called a confession of FAITH. Amen! +Continuing with the Language of FAITH and how to speak in FAITH. 22 And Jesus answering said unto them, Have FAITH in God. 23 For verily I say unto you, That whosoever shall SAY unto this mountain, Be removed, and be cast into the sea; and shall not DOUBT in his heart, but shall BELIEVE that those things which he said shall come to pass; HE SHALL HAVE WHATSOEVER HE SAID. +Whatever we maybe going through just speak the Word of God in Faith to the situation. +The Anointing (The Holy Spirit)with Faith in the Word of God will BRING IT TO PASS. •BLESSED we are and BLESSED we will always be and to God be all the GLORY. Amen! Today, why don’t you choose a few faith Scriptures to meditate on? 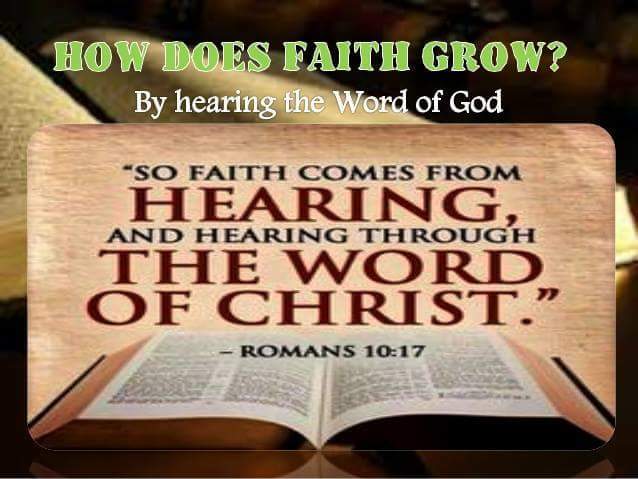 This entry was posted in Daily Message and tagged activate your faith, details on faith, how faith works. Faith takes no for an answer when the Word of God says YES!